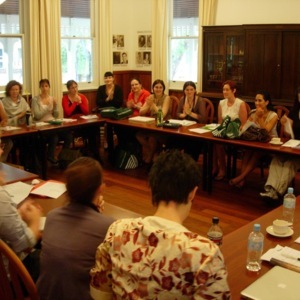 This photograph was taken during the Medievalism and Youth Culture Masterclass held at The University of Western Australia on December 6, 2011. The masterclass followed directly after the International Medievalism and Popular Culture Symposium. The symposium was attended primarily by undergraduate and postgraduate students, and was led by Clare Bradford, Stephen Knight, and Chantal Bourgault du Coudray. Topics discussed included children’s literature, picture books, gaming, young adult fiction, and film and television. “Medievalism and Youth Culture Masterclass,” Medievalism in Australian Cultural Memory, accessed April 25, 2019, http://ausmed.arts.uwa.edu.au/items/show/678.